One of the reasons the Hobbit struck a chord with me was not the adventure, though that is true, but because I share Bilbo's love of maps. I love maps, especially old ones. I have walked the fog cloaked streets of Victorian London. I have gone on gondolas in waterways of Glantri. I have walked across fields in the Flannaes. I have also talked about all these before. There are still some lands that I look at and they just scream at me to visit them. I want to play a game at the end of time. The sun lies huge and red in sky. The moon, if still there, has broken up. 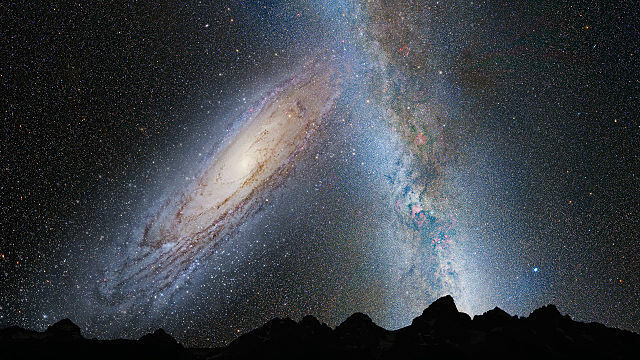 The night sky is filled with stars as the Andromeda Galaxy collides with our own. Society is crumbles and the human race is in decay. Wouldn't this make for a great night sky. I loved the Zothique stories of Clark Ashton Smith and there is just so much I could do with this. I also love the idea of the continents of the Earth have moved via plate tectonics to new positions. So there is only one great land mass. Plus I have been dying to use Astonishing Swordsmen & Sorcerers of Hyperborea for something. This could be it really. 99% of the work is already in the core books. I had already thought that the Earth in 150 million years looks a lot like the Hybora from REH's Conan. It seems like to me to such a logical fit. Hell. I might even use some of the less squicky bits from Carcosa; mostly because it captures the mood so well. I also have to admit I loved the Elric stories, the Books of Magic comics and the Doctor Who episodes that all take place at the end of time. There is one little issue though. Clark Ashton Smith's own Hyperborea was very much in the past. But not to worry. I have a way to scratch that itch too. I will admit I am fascinated by Doggerland. I talked about it a while back as a quasi-mythical; Middle-Earth. It also fills that ancient land niche that Hyborea tried to convey. I am not sure if my interest is enough to translate it into a gameable world. Afterall, Doggerland at it's largest was 16,000 BC and was flooded by 7,000 BC. It would be another 1000 years till humans learned how to brew beer! Though there are some Atlantis parrells that could be played with here. Maybe while humans were still running around whacking each other with sticks, or the weapon of mass destruction of the time, the stone axe, there were elves or something else in magnificent cities of glass and steel or even of unknown metals ruling the lands. In truth this reminds me a lot of Jason Vey's "Wasted Lands" idea. Maybe I'll through the lot into a blender and hit frappé. Maybe...maybe at the end of time reality breaks down and it allows the Old Ones to return and people of ancient forgotten lands and times are pulled in. So I can have Picts, Vikings, Romans and Dinosaurs with ancient forgotten necromancies. Maybe all the characters (PCs that is) of the past are drawn here. Something like Tanelorn or even "Lost". And there is this quote that keeps running around in my head after hearing it on the season finale of Doctor Who, "At the end of everything, one must expect the company of immortals. ".